Mercedes has revised its best-selling C-class model as part of plans to pass BMW and Audi in global premium sales. BERLIN (Bloomberg) -- Daimler CEO Dieter Zetsche said his expansion of Mercedes-Benz model offerings will enable the carmaker to beat competitors' sales growth and increase operating profit "significantly" in 2014. "Our determination is paying off," Zetsche said today at the annual shareholders meeting in Berlin adding that the manufacturer is "seeking to gain new customers by entering new segments for Mercedes-Benz." Zetsche has vowed that the Mercedes brand will overtake BMW’s core brand and Audi in premium car sales by the end of the decade by rolling out 30 new models, with a dozen having no predecessor. Daimler outlined in February plans to spend about 21.8 billion euros ($30 billion) for vehicle development and production capacity over the next two years, including at its heavy-truck business. Mercedes has bolstered demand by revising the compact models, including a complete redesign of the A-class hatchback, a new generation of the B class minivan, and the introduction of the CLA four-door coupe-like model and the GLA SUV. Vehicles planned for rollouts this year include a new version of the best-selling mid-sized C class model and a coupe variant of the S class coming out in September. "Demand for our compact cars remains so high that our production can barely keep up," Zetsche said. The carmaker has added shifts this year at German and Hungarian plants. Expansion plans outlined since mid-2013 include projects in China to help Mercedes double production capacity in the country and a 170 million euro program to return to making passenger vehicles in Brazil. Mercedes is also considering setting up a second plant in North America to complement a factory in Tuscaloosa, Alabama, that builds Mercedes SUVs and is adding the C class this year. BMW, which overtook Mercedes in 2005 to gain the global premium sales crown, is working to protect its lead, targeting 2 million group deliveries this year. Audi, which has held second place in the segment since beating Mercedes in in 2011, has also laid out plans to become No. 1 by 2020. Mercedes's sales jumped 13 percent in March to 158,523 vehicles, a record for single-month sales at the brand. 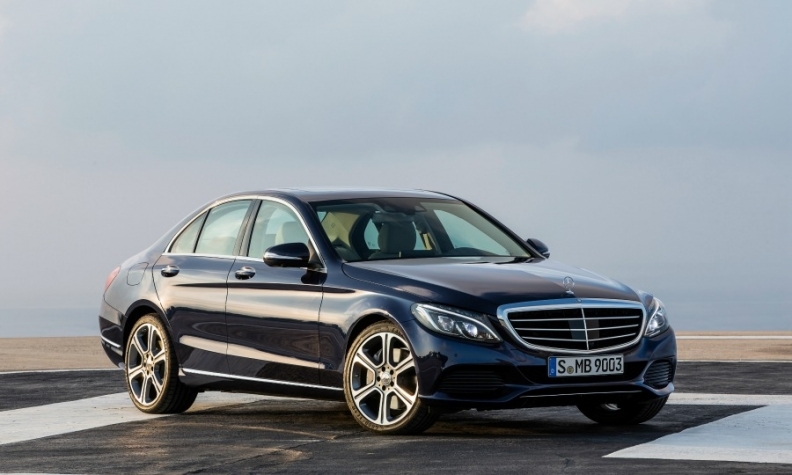 Demand was boosted by a 78 percent surge for the top-of-the-line S-class sedan, which was revamped in July, and a 26 percent jump for compact models. The March gain at Mercedes compares to increases of 15 percent to 170,450 at Audi and 17 percent to 186,126 at BMW, both the highest delivery figures for any single month for the brands. The three competitors are each targeting all-time high sales in 2014, which would mean the fourth consecutive annual record for both Mercedes and BMW and the fifth for Audi. Expansion in China, the world's biggest car market, is key to Zetsche's growth goal for Mercedes, which has been hampered in the past by separate sales organizations in the country for imported and locally produced cars. Mercedes merged the sales operations last year. Zetsche said today that the carmaker will add 100 dealerships for a network of 400 outlets in China by the end of this year. Daimler completed the purchase in November of a 12 percent stake in the BAIC Motor unit of local partner Beijing Automotive, whose chairman said today that the unit's planned initial public offering will take place in the second half and raise as much as $3.23 billion. A Mercedes SUV coupe prototype will go on display at the Beijing auto show later this month, offering a sporty vehicle with off-road capability, Zetsche said. "We're confident it will be a success." Daimler reiterated today that earnings before interest and taxes will rise "significantly" at Mercedes-Benz Cars, which includes the Smart brand, and at Daimler's Trucks unit, with the bus division reporting "slightly" higher profit and the van and financial-services businesses matching 2013 earnings. Shareholders are scheduled at today's meeting to vote on supervisory board candidates. Daimler nominated Bernd Pischetsrieder, a former VW and BMW CEO; Bernd Bohr, a former manager at supplier Robert Bosch; and Joe Kaeser, CEO of Munich-based engineering company Siemens, to replace three members whose terms are ending.